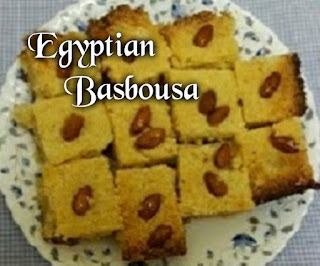 Basbousa is a term in the Middle East that refers to a sweet semolina dessert like cake. While it is baked all over the Middle East there are various ways to make this. My husband is from Egypt so of course I have learned to make it the Egyptian way. This cake is very simple and quick to make. Ingredients are very basic. Some basbousa recipes include eggs however the recipe I use is egg free. 1. Add semolina, coconut, and sugar in a large bowl and mix well by hand. 2. Add in butter and milk. Mix well. The texture should be a little clammy. 3. Press into a 9 x 9 inch pan. 4. Using a knife make lines from left to right and then from top to bottom forming squares. Place an almond or two in each square. 6. Remove from oven and pour syrup all over until no more can be absorbed. Allow to cool for 20 minutes. 1. Dissolve sugar and water in a medium saucepan. 2. Once dissolved add lemon juice. 4. Reduce heat and allow to simmer for about 10 minutes. It should look clear and not caramelized.Tip: Dip a metal spoon in the syrup and using caution, touch the syrup with a finger. The syrup should be a little sticky. 6. Once cake has finished pour about half of the syrup over the cake. Wait for a few seconds to allow the syrup to spread out. Then pour the remaining syrup slowly over the cake to ensure it has been evenly spread. Sounds soooooo good! Will try this for sure :) Thanks for linking up to Turn it up Tuesday! This is really good! You won't be disappointed. I have had these before and they are delicious. Thank you for sharing your recipe I'll have to try it out. Ooh these remind me of Indian sweets I would love to try one! wow i've never heard of this recipe. Thanks so much for sharing. I don't think I've tasted basbousa before. It sure sounds lovely, I bet it's worth a try! I don't think I've ever had this either but it looks delicious. This is awesome recipe. Love it. Haven't tried this but definitely will. Looks delicious! The ingredients are not really hard to find so this will be a great snack to serve for my children. It would be good too with coffee or tea! Haven't come across this before but as I nearly always have semolina in the kitchen cupboard I tempted to give it a try. Bookmarking it for later. Now I'm excited to try this. Tasting authentic recipes like this is a treat! 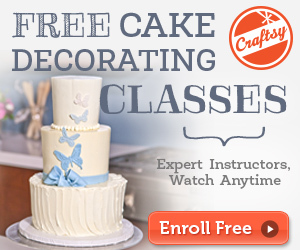 That is a great looking cake. It's fun to hear about a food favorite from Egypt! This Egyptian Basbousa looks delicious and I would love to try making this for sure. I have never heard of semolina so it will be interesting. Thanks for sharing the recipe.